See your Voice - Hear the Difference! 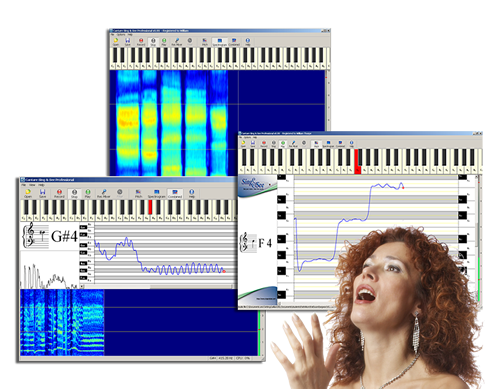 SING&SEE is vocal training software that helps you sing better by showing real-time visual feedback on your voice! SING&SEE is ideal for all vocalists – whether you’re professional or just someone who is into karaoke or Singstar! If you’re a singer and are looking for ways to improve your singing, then read on! SING&SEE is designed to give teachers a new tool to enhance your students’ lessons. Click here to find out how this innovative software can encourage your students to see how their voice could improve. Join the thousands of people around the world who are using SING&SEE to enhance their singing training! Click here to purchase a copy of the software for your Mac or PC. SING&SEE is the singing training software that teachers and singers all over the world are now using to improve their vocal training experience. It shows the singer and teacher visual displays that represent the voice - pitch, loudness, and timbre. This direct visual feedback enhances the spoken feedback that teachers give their students, and allows singers to see patterns in their voices that they might otherwise miss out on hearing. If you would like to experience for yourself how SING&SEE can help your singing teaching or learning, then sign up here to download a trial copy of the software for your Mac or PC, and receive a free tutorial about how to start using SING&SEE in your vocal training! Copyright © 2004-2019 Cantovation Ltd.